On Wednesday Sept. 26, five Fairfield FFA members attended the Ohio Legislative Leadership Conference. The members included Paige Teeters, Allyce McBee, Alexis Tompkins, Kohler Bartley and Thomas Fraysier. Students learned how to be an effective advocate for agriculture. They heard from John Torres, the director of government and industry affairs. They also heard from Senator Dave Burke. The members got to make their own plan for action and practiced how to present pressing issues to representatives. Members also enjoyed lunch and talked about pressing matters with a few state senators. Pictured, top to bottom, are Kohler Bartley, Thomas Fraysier, Paige Teeters, Allyce McBee and Alexis Tompkins. 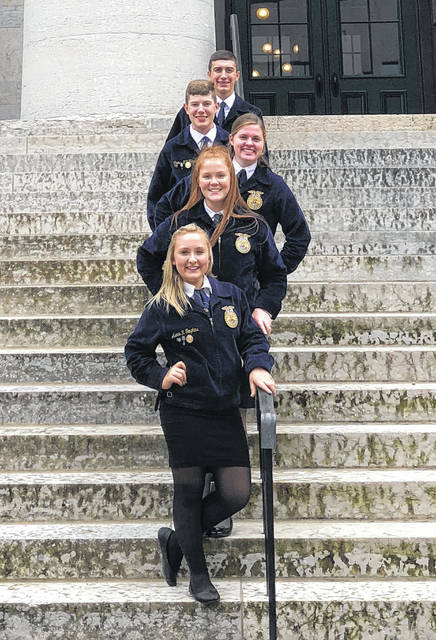 https://www.timesgazette.com/wp-content/uploads/sites/33/2018/09/web1_Fairfield-FFA.jpgOn Wednesday Sept. 26, five Fairfield FFA members attended the Ohio Legislative Leadership Conference. The members included Paige Teeters, Allyce McBee, Alexis Tompkins, Kohler Bartley and Thomas Fraysier. Students learned how to be an effective advocate for agriculture. They heard from John Torres, the director of government and industry affairs. They also heard from Senator Dave Burke. The members got to make their own plan for action and practiced how to present pressing issues to representatives. Members also enjoyed lunch and talked about pressing matters with a few state senators. Pictured, top to bottom, are Kohler Bartley, Thomas Fraysier, Paige Teeters, Allyce McBee and Alexis Tompkins.